The following Terms of Service (“Agreement”) govern your membership to and use of the Pro Sports Group service (“Service”). Please read the terms contained in this Agreement carefully. You can access this Agreement at any time by visiting our Terms of Service. These terms may be modified by Pro Sports Group from time to time. Continued access of the Service by you will constitute your acceptance of any changes or revisions to the Agreement. Since the Service is designed to provide an enjoyable and informative experience for all participants, you agree to abide by certain rules regarding your participation. Your failure to follow these rules, whether listed below or posted at various points in the Service, may result in termination of your access to the Service, without notice, in addition to Pro Sports Group’s other remedies. You may be required to provide Pro Sports Group with certain personal information. You agree and represent that all personal information provided by you is accurate and up to date. If any of your personal information changes, you must update it by notifying Pro Sports Group. We reserve the right to change our prices at any time for sales, promotions or to keep up with market competition without fear of chargeback. Your right to use the Service is personal to you – you may not authorize others to use the Service, and you are responsible for all use of the Service. You may not sub-license, transfer, sell, or assign this Agreement to any third party without our written approval. Any attempt to do so will be null and void and shall be considered a material breach of this Agreement. You will be solely responsible for maintaining the confidentiality of your username and password. You are solely responsible for all usage or activity on your Pro Sports Group account including, but not limited to, use of the account by any person who uses your subscriber/membership username and password. Pro Sports Group may charge you fees for access to portions of the Service or for the Service as a whole. You agree to pay all fees and charges, including applicable taxes, incurred through your account at the rates in effect for the billing period in which such fees and charges are incurred, including but not limited to charges for any products or services offered for sale through the Service by Pro Sports Group or by any third party vendor or provider (such fees, charges and taxes shall collectively be referred to as “Fees”). Pro Sports Group reserves the right to change the amount of, or basis for determining, any Fees, and to institute new Fees, effective upon prior notice to you, pursuant to the notice procedure described below. We reserve the right to change our prices at any time for sales, promotions or to keep up with market competition without fear of chargeback. If you submit your credit card information to Pro Sports Group upon ordering, you give Pro Sports Group permission to charge all Fees incurred through your account to the credit card you designate. Any additional Fees (other than renewal fees) will be charged at the time they are incurred. If payment cannot be charged to your credit card or your payment is returned to Pro Sports Group for any reason, including charge back, Pro Sports Group reserves the right to either suspend or terminate your account and all its obligations under this Agreement. Due to the nature of the digital products and services that we provide, we are unable to issue refunds once you have accessed the information. Individuals who request a refund will be credited the original purchase price of the Service less a $35.00 cancellation fee, provided they request to cancel their subscription to the product or service within 24 hours after the order has been placed and have not accessed the services during this period. · No refunds will be issued if the cancellation/partial refund request occurs after the 24-hour period or you have accessed the site via your login. · All refunds and/or cancellations must be addressed via email to support@prosportsgroup.com in writing. We reserve the right to change our prices at any time for sales, promotions or to keep up with market competition without fear of chargeback. No partial refunds will be issued if the cancellation/partial refund request occurs after the 24-hour period. You agree not to use any obscene, indecent, or offensive language or to place on the Service any material that is defamatory, abusive, harassing, or hateful. Further, you may not place on the Service any material that is encrypted, constitutes junk mail or unauthorized advertising, invades anyone’s privacy, or encourages conduct that would constitute a criminal offense, give rise to civil liability, or that otherwise violates any local, state, national or international law or regulation. You agree to use the Service only for lawful purposes, and you acknowledge that your failure to do so may subject you to civil and criminal liability. You acknowledge that Pro Sports Group has not reviewed the content of all sites linked to from this Service and is not responsible for the content or actions of any other sites linked to from this Service and does not endorse them. Your linking to any service or site is at your sole risk. 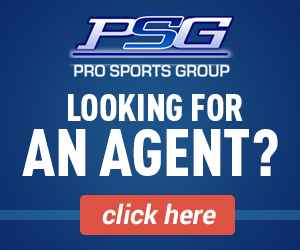 You acknowledge that you will not directly or indirectly compete with the business of Pro Sports Group for a period of at least 5 years from the time you registered for the Service. The term “non compete” as used herein shall mean that you shall not own, manage, operate, consult, or be an employee in a business substantially similar to or competitive with the present business of Pro Sports Group. Any attempt to do so will be null and void and shall be considered a material breach of this Agreement. Pro Sports Group reserves the right to either suspend or terminate your account and all its obligations under this Agreement. 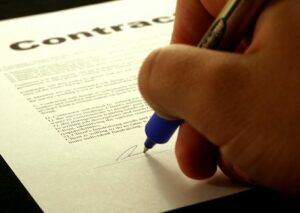 You acknowledge that Pro Sports Group shall or may in reliance of this Agreement provide you with trade secrets and other confidential information. You agree to retain said information as confidential and not disclose or sell said information to any third party. Pro Sports Group may give notice(s) to you by means of a general notice on the Service, email to your email address, or by written communication sent by mail to the address you have provided. 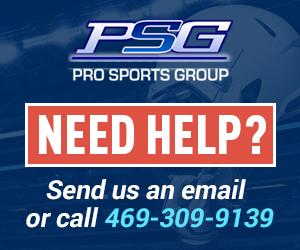 You may give notice to Pro Sports Group (such notice will be deemed given when it is received by Pro Sports Group) by means of email to our email address at support@prosportsgroup.com. You agree that Pro Sports Group and its third-party service providers are not responsible, and shall have no liability to you, with respect to any information or materials posted by others, including defamatory, offensive or illicit material. Pro Sports Group does not necessarily endorse, support, sanction, encourage, verify, or agree with the comments, opinions, or statements posted on bulletin boards, forums, or otherwise contained in the Service. Nor does Pro Sports Group or its third-party service providers make any warranties with respect to any of the merchandise featured or mentioned in the Service. Any information or material placed online, including advice and opinions, are the views and responsibility of those who post the statements, or those who actually sell any merchandise, and do not necessarily represent the views of Pro Sports Group or its third-party service providers. You agree to indemnify Pro Sports Group and its affiliates, employees, agents, representatives, and any third-party service providers, and to defend and hold each of them harmless, from any and all claims and liabilities (including attorneys’ fees), which may arise from your submissions, from your unauthorized use of material obtained through the Service, or from your breach of this Agreement, or from any such acts through your use of the Service. Pro Sports Group reserves the right, but undertakes no duty, to review, edit, move, or delete any material provided for display or placed on the Service or its bulletin boards, in its sole discretion, without notice. YOU ACKNOWLEDGE THAT YOU ARE USING THE SERVICE AT YOUR OWN RISK. THE SERVICE IS PROVIDED “AS IS,” AND PRO SPORTS GROUP, ITS AFFILIATES, AND ITS THIRD-PARTY SERVICE PROVIDERS HEREBY EXPRESSLY DISCLAIM ANY AND ALL WARRANTIES, EXPRESS AND IMPLIED, INCLUDING BUT NOT LIMITED TO ANY WARRANTIES OF ACCURACY, RELIABILITY, TITLE, MERCHANTABILITY, NON-INFRINGEMENT, FITNESS FOR A PARTICULAR PURPOSE, OR ANY OTHER WARRANTY, CONDITION, GUARANTEE OR REPRESENTATION, WHETHER ORAL, IN WRITING OR IN ELECTRONIC FORM, INCLUDING BUT NOT LIMITED TO THE ACCURACY OR COMPLETENESS OF ANY INFORMATION CONTAINED THEREIN OR PROVIDED BY THE SERVICE. PRO SPORTS GROUP, ITS AFFILIATES, AND ITS THIRD-PARTY SERVICE PROVIDERS DO NOT REPRESENT OR WARRANT THAT ACCESS TO THE SERVICE WILL BE UNINTERRUPTED OR THAT THERE WILL BE NO FAILURES, ERRORS, OR OMISSIONS OR LOSS OF TRANSMITTED INFORMATION, OR THAT NO VIRUSES WILL BE TRANSMITTED ON THE SERVICE. PRO SPORTS GROUP, ITS AFFILIATES, AND ITS THIRD-PARTY SERVICE PROVIDERS SHALL NOT BE LIABLE TO YOU OR ANY THIRD PARTIES FOR ANY DIRECT, INDIRECT, SPECIAL, CONSEQUENTIAL OR PUNITIVE DAMAGES ALLEGEDLY SUSTAINED ARISING OUT OF THIS AGREEMENT, THE PROVIDING OF SERVICES HEREUNDER, THE SALE OR PURCHASE OF ANY GOODS OR MERCHANDISE, YOUR ACCESS TO OR INABILITY TO ACCESS THE SERVICE, INCLUDING FOR VIRUSES ALLEGED TO HAVE BEEN OBTAINED FROM THE SERVICE, YOUR USE OF OR RELIANCE ON THE SERVICE, OR ANY OF THE MERCHANDISE, INFORMATION OR MATERIALS AVAILABLE ON THE SERVICE, REGARDLESS OF THE TYPE OF CLAIM OR THE NATURE OF THE CAUSE OF ACTION, EVEN IF ADVISED OF THE POSSIBILITY OF SUCH DAMAGES. YOU HEREBY AGREE TO RELEASE PRO SPORTS GROUP, ITS AFFILIATES, AND THIRD-PARTY SERVICE PROVIDERS, AND EACH OF THEIR RESPECTIVE DIRECTORS, OFFICERS, EMPLOYEES, AND AGENTS FROM CLAIMS, DEMANDS, AND DAMAGES (ACTUAL AND CONSEQUENTIAL) OF EVERY KIND AND NATURE, KNOWN AND UNKNOWN, SUSPECTED AND UNSUSPECTED, DISCLOSED AND UNDISCLOSED (“CLAIMS”), ARISING OUT OF OR IN ANY WAY CONNECTED WITH YOUR USE OF THIS SERVICE, INCLUDING ANY DISPUTES BETWEEN USERS. Pro Sports Group has the right to terminate your ability to access the Service, for any reason, without notice. Pro Sports Group does not represent that materials and content on the Service are appropriate or available for use in countries outside the United States. If you choose to use the Service from outside the United States you are solely responsible for compliance with foreign and local laws. You agree that this Agreement, for all purposes, shall be governed and construed in accordance with the laws of the State of Texas and the United States applicable to contracts to be wholly performed therein, and any action based on or alleging a breach of this Agreement must be brought in a state or federal court in Texas. In addition, you agree to submit to the exclusive personal jurisdiction and venue of such courts. Pro Sports Group shall not be liable for delays in performing or failure to perform this Agreement or any obligations hereunder, which are directly attributable to causes beyond its reasonable control, including but not limited to, acts of God, fires, strikes, labor disputes, war, acts or intervention by any governmental authority, failure of a common carrier, supplier, hardware, software, browser, or communications equipment, or network failure, congestion, or malfunction. If you don’t agree to the terms contained in this Agreement, please exit the web site.